Good news, everybody! Winter is coming! Of course, that means it's also the return of street litter season, when plenty of otherwise generous community-minded folks suddenly decide that they should leave their worthless junk out in the street blocking the public way, instead of in the alley next to their trash can where it belongs. 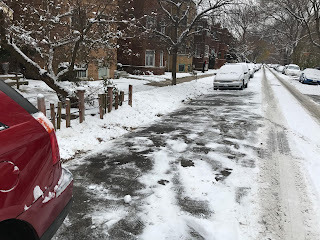 Instead of littering, I invite you all to join me in being extra neighborly this winter: don't just shovel out your own car when it snows, but clear out all the snow and street litter from a couple of extra street parking spaces nearby too. Your neighbors who come home after a long day's work and need a place to park will appreciate it, and I'm sure they will be out there helping clear out another few spaces the next time it snows. and other debris, and ready for anybody to park in.